There is a scene in The Nice And The Good by Iris Murdoch that encompasses everything you need to know about suspense writing. For 15-year-old Pierce in particular, this sea cave is a place of fascination and dread. He fears it more than the other children do, and, equally, wonders about the possibilities of this hidden space, and marvels over the chance there could be a secret safe spot in there, or whether one would inevitably be drowned. Towards the end of the novel, his heart has been broken, he’s cross with the world, and his behaviour is becoming increasingly erratic. The cave, seems to be the answer to this – the opportunity to face the threat head on, while allowing it to prise from him the choice of life over death. Once inside, with the entrance sealed by the tide, he will be at its mercy, and that, in his current state of mind, is oddly appealing. But even this disastrous plan doesn’t go quite to plan. No sooner is he swallowed up by the darkness than he hears splashing nearby and discovers that Mingo, the family dog, has followed him in. Then John Ducane, a friend of his mother’s, swims in to see if he can find the boy. Now three lives are at peril in a dense, cold, alien blackness of the cave, and the reader (in my case, at least), is transfixed. Murdoch’s writing of this scene, which lasts just 21 pages, showcases her sheer mastery of tempo, human interest and realism. Much of the time we are inside the minds of the characters’, hearing more of their thoughts than of dialogue, and feeling as they grow weary, then numb, then agonised, bit by bit. Much of their concern is fairly basic – how not to drown – but truly the biggest feat here is to keep them sane and relatively calm, while ensuring the reader is utterly gripped to the edge of their own sanity. The lack of light itself has a character in this setting. John Ducane, known amongst his friends for his steadiness, is frightened by the “thick shut-in darkness.” Alone, he sees images play out against it, as the water seems to change consistency about him, growing “oilier” and “gluey”, through which swimming has a “yearning” movement. The whole cave, felt and unseen, has become a representative of the emotions flaring inside it, and you can’t help but believe you are there too. Weirdly, perhaps in part because of the language or even the smell of the old Penguin edition I read, I found myself reminded of Enid Blyton’s The River of Adventure, yet I can’t remember it clearly enough to know whether there was a scene of darkness and water and the sense of being trapped, to explain this. The darkness here is the overriding impression – the stuff of childhood nightmares, quietly suffocating and unending. Senses alter in this environment, so that we learn the smell of the place, but more than that the sensations, as well as all the personal physical discomforts, exhaustion and the craving to give up. What are you reading? Impressed by a particular scene? I’d love to know. I’m always happy to receive reviews and comments on books, art, theatre and film. Please send an email to Judy(at)socketcreative.com. 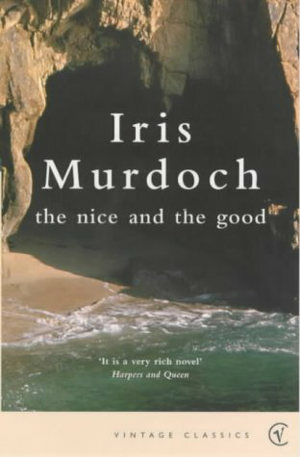 This entry was posted in Writing tools and tagged Gunnar's cave, Iris Murdoch, The Nice and the Good, writing masterclass by Judy. Bookmark the permalink.